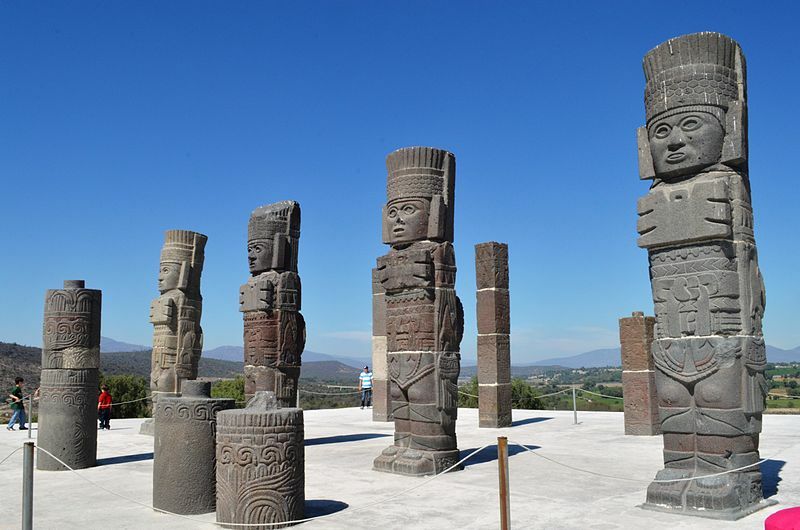 The four Atlantes of Tula are basalt pillars carved in the form of Toltec warriors and are thought to have once supported the roof of the Temple of Tlahuizcalpantecuhtli (“The Morning Star”), which once stood atop Pyramid B. The warriors themselves can be seen wearing their full battle regalia: butterfly-shaped breastplates, feathered headdresses, spears, spear throwers (or atlatl), decorative sandals, and sun-disks on their backs. It is thought that the warriors represent the god Quetzalcoatl in his manifestation as Tlahuizcalpantecuhtli, the warrior Lord of the House of the Dawn who was associated with Venus as the morning star. When the Toltec Empire crumbled in the 12th century, many of Tula’s statues, including the four Atlantes, were torn down and unceremoniously dumped in a trench that had been dug into the north face of Pyramid B. The warriors were eventually reassembled and returned to their original positions following the excavations of the Tula site in the 1940s. Visitors to the site can now see them gazing eastwards and downwards onto Tula Grande, the ancient city’s political and ceremonial centre. ** The use of the word “atlantean” here has nothing to do with the mythical lost island of Atlantis that features so heavily in Tomb Raider I and Anniversary. “Atlantes” is simply the plural form of the architectural term “atlas”, which refers to the use of a male human figure as a supporting column. Those who are familiar with Greek mythology will probably remember that Atlas was a Titan who was condemned to hold up the heavens for all eternity as punishment for his involvement in the war against the Olympian gods. I must write an Obscure Pre-Columbian Sunday post on the (In)Tolerable Toltecs. I love that all the sources seem to delight in saying that, though the Aztecs were big fans of Toltec art (I think “Toltec” actually means “artesan” in Nahuatl), they didn’t seem to produce much that was impressive–except for the Atlantes, of course! Reblogged this on The Amateur Archaeologist.